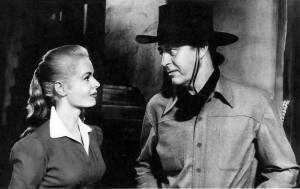 Although he’s frequently dirty and sometimes unshaven, Welsh-born Ray Milland still seems like an unusually fastidious cowboy with an eastern-ish accent. Wesley Steele (MIlland) is a known gunman, but not exactly an outlaw, stranded in the desert. He stumbles on a robbed stage, where six people have been killed, and then into a bank robbery in Mesa, a town controlled by Stanley (Raymond Burr). He is blamed for both, and the hunt is on for Steele in earnest. 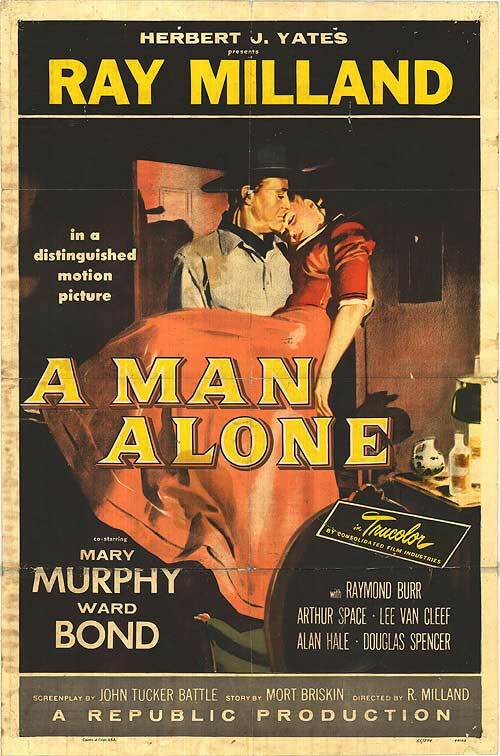 As he escapes, he seeks refuge in the basement of a house that turns out to be owned by local sheriff Gil Corrigan (Ward Bond) and his daughter Nadine (Mary Murphy, best known for her role as Marlon Brando’s girlfriend in The Wild One two years previously). The sheriff is incapacitated with yellow fever, and the house is quarantined. Steele wins Nadine’s confidence by helping to care for her father, even though she knows the whole town is looking for Steele. It turns out that both the bank robbery and the heinous stage robbery were carried out by Stanley and his henchmen (including Lee Van Cleef). Steele has to win over the recovered sheriff, who, once persuaded, lets him go and is then about to be lynched by irate townspeople. Steele re-appears and saves him. Steele gets the girl, who seems much younger than he. In color, especially Murphy’s blond hair, at 96 minutes. 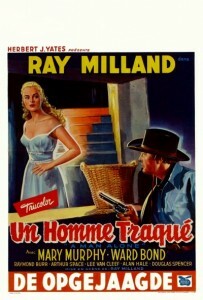 A rare western with Ray Milland, directed by Ray Milland, and it’s watchable, with a good supporting cast. For Milland in another western, see Copper Canyon (1950), with Hedy Lamarr. This entry was posted in Westerns Worth Watching and tagged Manhunts, Ray Milland, Ward Bond on April 5, 2014 by Nicholas Chennault.